Even though trees drop their leaves before the cold season, they still require preparation and care to help them stay healthy during the winter months. Trees that have the right care during the winter will welcome spring with healthy new growth and greater fortitude against infection, insects and disease. 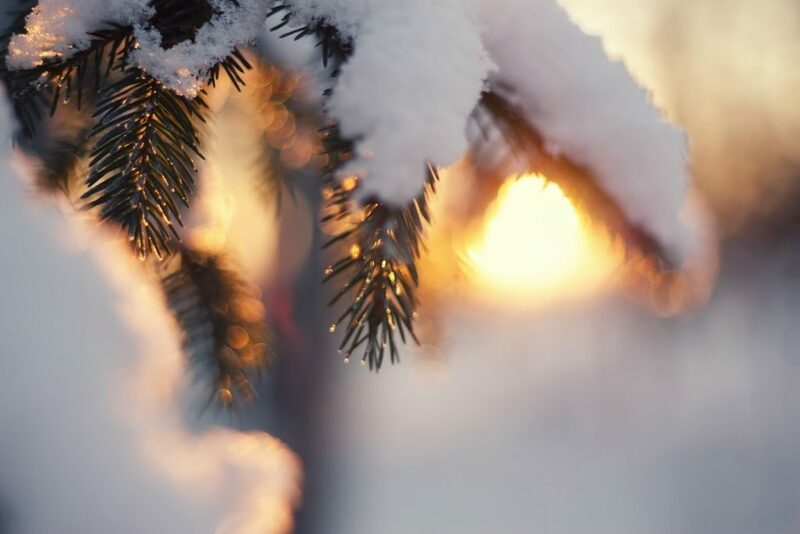 Here are some simple things you can do to make sure your trees stay as healthy as possible this winter. Mulch is an essential part of winter tree care, especially if your tree is young or recovering from disease. A generous layer of mulch helps to prevent moisture loss from the soil to dry winter air. Mulch also provides insulation for the roots, which can be useful in areas with temperatures that vary from warm to cold throughout the winter months. When adding mulch, be careful not to stack it directly against the trunk, as the mulch will trap moisture against the trunk and weaken the bark. Also, wait to spread autumn mulch until after the first frost to prevent mice from nesting in the warm mulch. Mice can eat tender bark from new trees. Your next task should be to provide some protection to the trunk of the tree. Young trees have tender bark that is appealing to hungry deer and rabbits. You can protect the bark by placing trunk guards around the base of tree. Protecting the bark from deer and rabbits is essential to your tree’s health. The lower layers of the bark contain the pathways for nutrients to travel from the leaves to the roots and vice versa. When these pathways are removed, the tree will slowly starve to death as the roots are not able to get the food they need to stay strong. Another threat to the trunk of you tree that comes from winter is cracking due to thawing and freezing. If you have a warm winter with temperatures above freezing during the day but drop at night, your tree will also thaw and freeze. This condition is called sunscald, and it can be deadly. Contact a local tree service for paper to wrap the trunk to help protect the bark. You should also consult a tree service if your tree has already had trouble with sunscald to patch the cracks or inspect the tree for disease. Many people remember to water their trees in the summer when the season is dry and the rain is scarce, but you may forget your tree still needs water when temperatures fall. Trees don’t need as much water during the winter because they aren’t supporting the needs of summer growth. However, winter is a dry time, and your trees can start to suffer if the soil is not moist. The best thing to do is to water your trees through the fall. Make sure they get plenty of liquid before the ground begins to freeze. If you have a warm spell where temps stay above freezing for a week or two, water during this time as well. Your tree’s roots will be much stronger come spring if they have sufficient moisture over winter. Evergreens are common in Colorado, and they have a reputation for being hardy and adaptable for cold climates. While this is true, evergreens (including broadleaf varieties like holly) are more susceptible to moisture loss during a dry winter because they still have respirating needles, unlike deciduous trees that drop their water-losing leaves. If moisture loss is severe, the needles will begin to curl and brown, eventually dropping from the tree. You can reduce respiration from evergreens by spraying the needles with a specialized waxy spay. Some more delicate evergreens, like cedars, may need a burlap wrap to provide insulation and prevent branches from being broken or damaged by ice, wind and snow. Never wrap an evergreen with plastic, because plastic does not allow a tree to breathe. Sometimes, trees can benefit from winter pruning. There are fewer pathogens and active insects in winter, which means the wounds are safer and have more time to heal. However, a tree may often heal more slowly during cold weather, and pruning takes expertise, so you should leave all pruning to the hands of tree experts. Fertilizer can also be beneficial, especially for new or young trees. The nutrients help to fortify a tree, fostering disease resistance throughout the winter months. Use a fertilizer that has low levels of nitrogen, since nitrogen is meant for growth stimulation (new leaves and root shoots). If you are hoping to provide nitrogen for spring growth, fertilize in later winter with a slow-release fertilizer so the nitrogen doesn’t run off or leach down into the soil. Since the type of fertilizer your tree needs will depend on your soil type, the tree type and the age of your tree, always consult a tree service before fertilizing. For more information, contact us at Schulhoff Tree & Lawn Care, Inc.